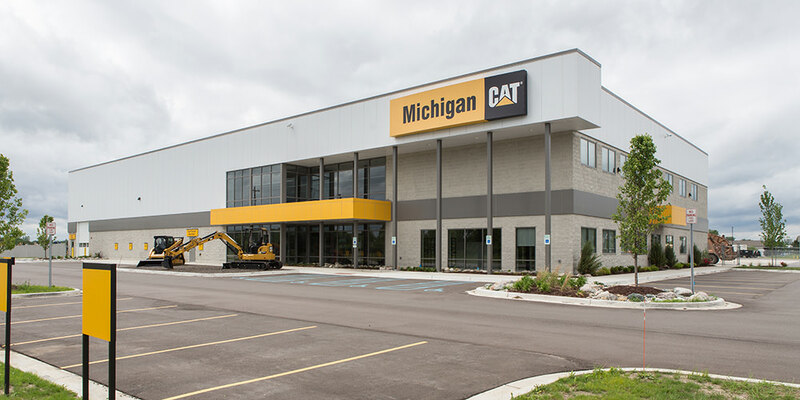 Beginning with pre-construction efforts, Granger worked closely with Michigan CAT to identify and understand operational and construction needs. Following that, Granger was selected to build the company’s new 51,960 s.f. facility. The new facility serves multiple functions including a corporate office, sales, service and rentals. The corporate office/service building provides 17,760 s.f. of service bays, 9,800 s.f. of parts distribution and a two-story, 24,400 s.f. corporate office to support rental, retail sales, training and administrative support functions. Service areas include 10 overhead bridge cranes and 3 jib cranes. A separate 13,600 s.f. utility building will be utilized for paint preparation, painting, welding, fabrication, sandblasting, equipment washing and yard manager support. The utility building includes a two-compartment paint booth and an engine dyno room. The completed site also provides areas for employee and visitor parking, parts pick-up, new and used equipment sales and rental returns. Granger facilitated, coordinated, and contracted all owner furnish equipment, including paint booths, oil distribution systems, cranes, and equipment washing systems.